As our knowledge of Kombucha continues to evolve, it has been discovered by many a brewer that the SCOBY LOVES green tea. Our hand-blend of different green teas grow robust cultures, may shorten the brewing time and add a smooth flavor to your booch. Plus, all of the proven health benefits of green tea will be passed along to you in your brew! 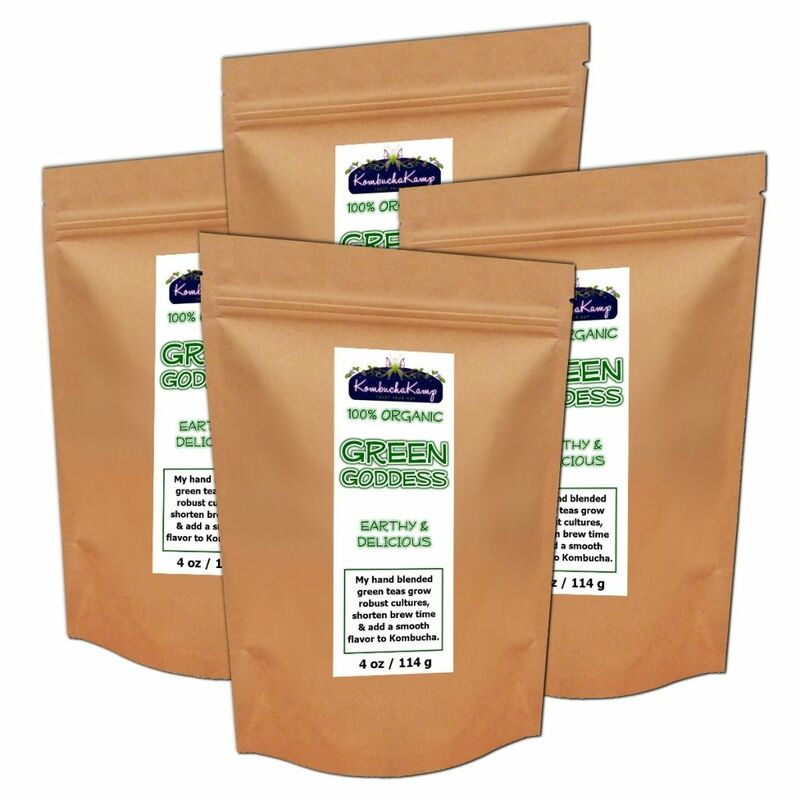 Green Goddess is also the tea blend we use to cultivate our Jun cultures. With a balance of grassy & floral notes, this blend makes for delicious ferments or a terrific cup of tea to stimulate with calm, focused energy. This tea has less caffeine than the Hannah's Special Tea Blend but more than the Yin Yang Blend. Delicious & well balanced. Makes terrific tasting Jun. If you want to feed your Jun culture the very finest tea this is it! Watch your culture get stronger with every brew and enjoy this mild yet earthy and flavorful tea! The perfect choice for Jun! Bulk prices are super reasonable for the quality. Vicki (Brentwood, TN) I have been making Jun since June 2017 with the Green Goddess tea blend. It has a mild flavor that is delicious alone and is great when doing a second frementation, because it lets the additional flavors shine through. It also produces very hardy SCOBYs. I tried Hannah's Green Goddess Blend after being highly impressed with her Special Blend Tea for Kombucha. I have to say that the Green Goddess has made amazing tasting kombucha! Hannah's customer service alone deserves 5 stars! Every time I have emailed or phoned with a question, she responds very quickly and thoroughly answers my questions. I will only purchase the teas for my kombucha from Hannah, everything else pales in comparison! wrote the Book' on kombucha & Jun Brewing. Hannah's Green Goddess blend is a delight! I like green tea, and this blend is a step up. Makes good hot tea and really nice KT. (Warrior, AL) I bought the Green Goddess tea to brew Kombucha. After using Hanna's Special Blend, I had high expectations. I have not been disappointed. I feel it creates a light and refreshing Kombucha. I really enjoy it by using dried chamomile or elderflowers and ginger in the second fermentation. It gives it a champagne taste. I let it ferment a second time for a minimum of 3 days. Very delicate mix of green teas that produces a delicious tea and Kombucha brew. Very pleased with the result and very happy to have bought it from KKamp, as the staff are very helpful and nice. I use the Green Goddess Blend for my Jun and it is excellent every time. 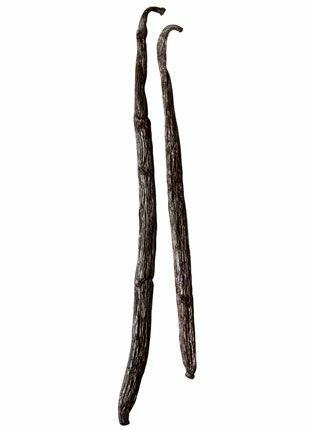 Makes a nice light flavor with lots of health benefits. I love this blend it takes the guess work out of my brewing. It makes perfect jun all the time! Thanks to Hannah and KKamp. Love this tea. Being organic is important to me. Tastes great both in my Kombucha and as hot or ice tea. Scoby loves it too! I ordered this in the 1 lb - best value and was pleasantly surprised that a muslin tea bag for brewing was also included! A great value on organic green tea! I lover this tea!! I really like the flavor of the kombucha! It has a very smooth taste - delicate. Even by itself as a cup of tea is very soothing. I prefer this over the Hannah's Special Blend, although that is good too. I am not crazy about the price - order in a 1 lb supply! You are paying for Hannah's expertise, which she definitely has!! This is the only green tea I have used for my jun tea, and is the only one I plan to ever use! It has been making perfect Jun for months, and I fully trust that it is the best out there. I don't know a lot about green tea so this is what I am using and I am happy with the look and smell of the blend. I was surprised to find a reusable tea bag with my order. That is great! Making the tea with loose leaves is so simple with the bag. I have to say hands down the best green tea I have ever used. I use this for my Jun. I couldn't believe how floral this green tea is. The Jun tea is smooth and delicious. I am happy to have found Kombucha Kamp and their quality cultures and supplies. Thank you Hannah and your Kombucha Kamp Family! I bought Green Goddess Tea for brewing my JUN tea and it is fantastic. Love the fact that it is organic. The special green tea mix from KKamp and the little brewing sock work well. Very gentle flavor, growing a little stronger and more interesting as the batches progress (I am using continuous brew method). Thank you, KKamp, I'll recommend you to all my friends! This tea is seriously great. Makes my kombucha taste way better than before. I do love it and will definitely be back for more. All my friends rave even more about my booch. Way to go Hannah. I have been successfully brewing single batches of Jun tea with the Green Goddess Blend for a few months now and I and my SCOBYs love it! The flavor is light and delicate and it's been a great base for secondary fermentation flavors ranging from ginger to cloves and turmeric. Thanks, KK! Once my Hannah's Special ran out, I couldn't resist trying out this green tea. It's created an interesting new flavor that I'm really enjoying, and am very glad that I bought it! This blend is high quality tea and I was able to make several batches of kombucha from the bag I purchased. The flavor is light and I love that it is organic. This is the best choice if you are trying to avoid caffeine. I love, love, love the Green Goddess Blend for my kombucha. Everyone who trys it loves it including my grandsons, who also enjoy Kombucha popsicles made from the beautiful green blend. Very smooth flavour! This blend has converted many people to Kombucha who had tried others and did not like the taste! Awesome stuff! Thanks Hannah! I love Hannah's Green Goddess Tea Blend! I tried it because the black tea was not doing well with my stomach. The green tea blend has a great, light taste and allows the flavors from my 2nd ferment to really come through. My scobies love the green tea - they grow so quickly now. It is a definite try for home brewers. I ordered the Green Goddess tea thinking it was pretty pricey and imagined I would look for a less expensive tea for future brewing. I have been a tea drinker for many years and I honestly have never found a better tea! I will not be looking for any other tea as I know I would only be disappointed. Obviously , I give it 5 stars. The Green Goddess Tea blend is outstanding! My Jun Kombucha loves it and so do I! I LOVE the Green Goddess tea blend. It is a thoughtful blend of real tea leaves, and the results of using this custom blend is way better than using cheap grocery store bags. Keep up the good work and thank you for the e-mails that you so kindly send. Well done! This has been so lovely in my JUN cultures. I really appreciate that Hannah has put together this tea and her Special Blend to make the best brews for fermenting. This tea is spectacular! It's great for kombucha and jun tea. I'm so glad I tried it. It's my favorite now. i really love the green tea to make kombucha. I also like the little cloths to cover my mason jars with. I continue to brew kombiucha with my scoby and get new ones all the time. The green tea smells so delightful and yummy. It's probably the best I have bought and brewed kombucha with. I was very impressed by this blend! Nice flavor and the brew processes super fast. Organic is important too. Thank you! I love this Green Goddess tea! It makes a really fresh tasting liquor on its own; but the Kombucha it makes is very reminiscent of a light, dry wine. I'm totally addicted! I got this for my Jun and it makes a wonderful brew!!!!!!!! Thank You KK Your the Best!!!!!!!! I was very pleased with the product I purchased and I received product within a couple days of ordering. Great place to do business. The is a wonderful green tea blend. I have been thrilled with the results of my Kombucha! Love the flavor of this tea. I'm so thankful Hannah suggested it. I'll definitely be purchasing more. I just started using the Green Goddess tea blend & am loving it. The booch tastes great & I'm happier getting the healthy healing benefits of green tea. Love having a friendly, knowledgeable REAL VOICE on the phone. Thanks Hannah! 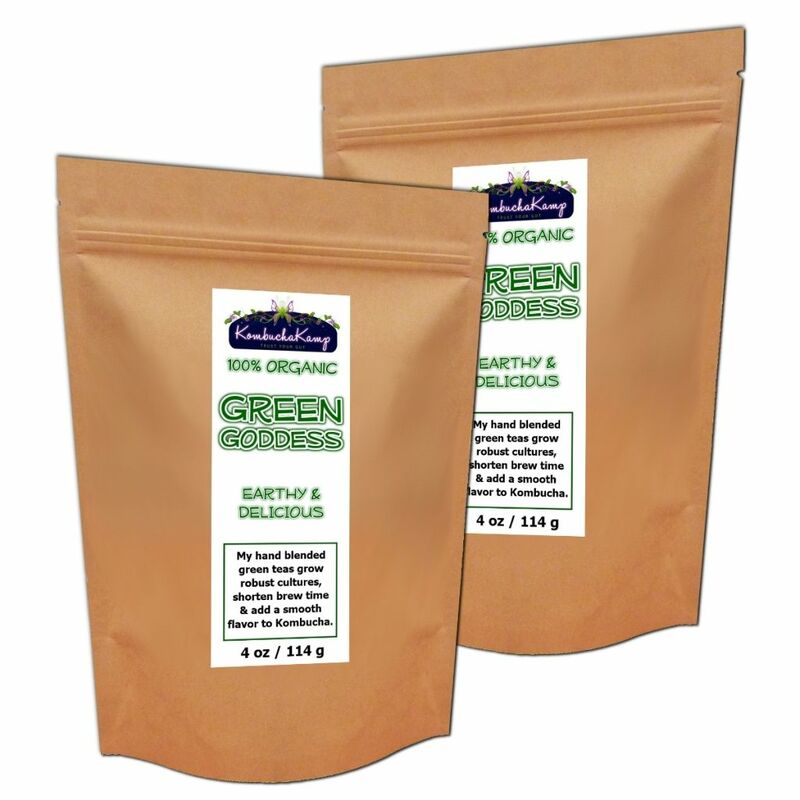 I love to open the package to inhale the exotic and fresh aroma of the Green Goddess tea blend. My kombucha SCOBYs have been thriving in a mix of Green Goddess and black tea for over a year now. I wouldn't make a batch without this blend as it imparts a flavorful taste to my brews. I have been making tea since March using Hannah's special blend. I now add some green goddess with the special blend and love it. I share my tea with others who make Kombucha and they love my tea more than theirs. I think the secret is a little extra green goddess. It is wonderful! I decided to try the green tea blend when I was ordering Hannah's Special Tea Blend, just to try something new. I am a newbie at Kmbucha (on my 6th batch). My first batch of all green tea is now complete and flavored - it really is delicious. I like the fact that I'm getting all the green tea benefits. It tastes wonderful with ginger and lemon as a flavouring. I highly recommend this green tea and Hannah's special blend. 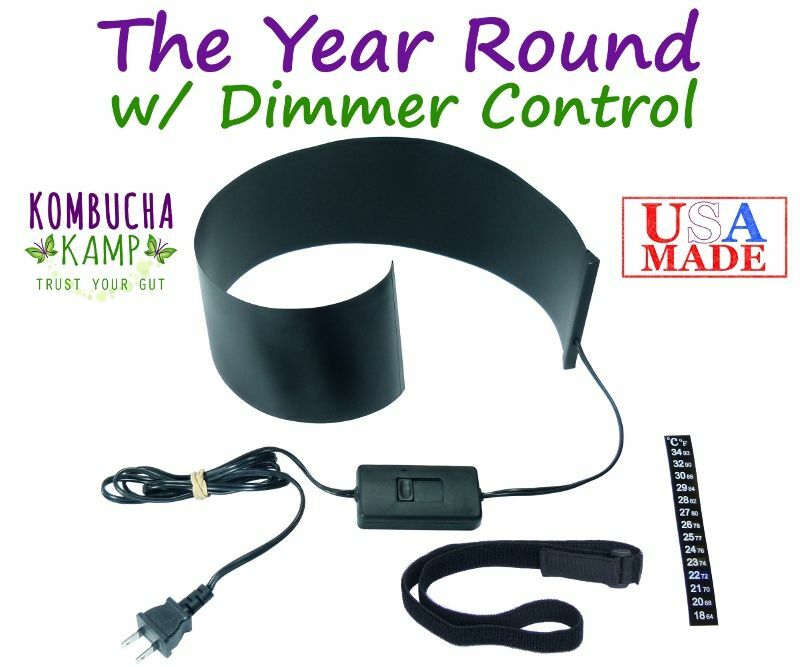 Don't hesitate on the price - it long pays for itself once you start making your own booch and stop paying $4-5/bottle at the health food store! Just Do It! This is the tea I have been using in my CB and it tastes great. It is a great tea by itself as well. I really enjoy Green Tea but I have never mixed multiple green teas together. 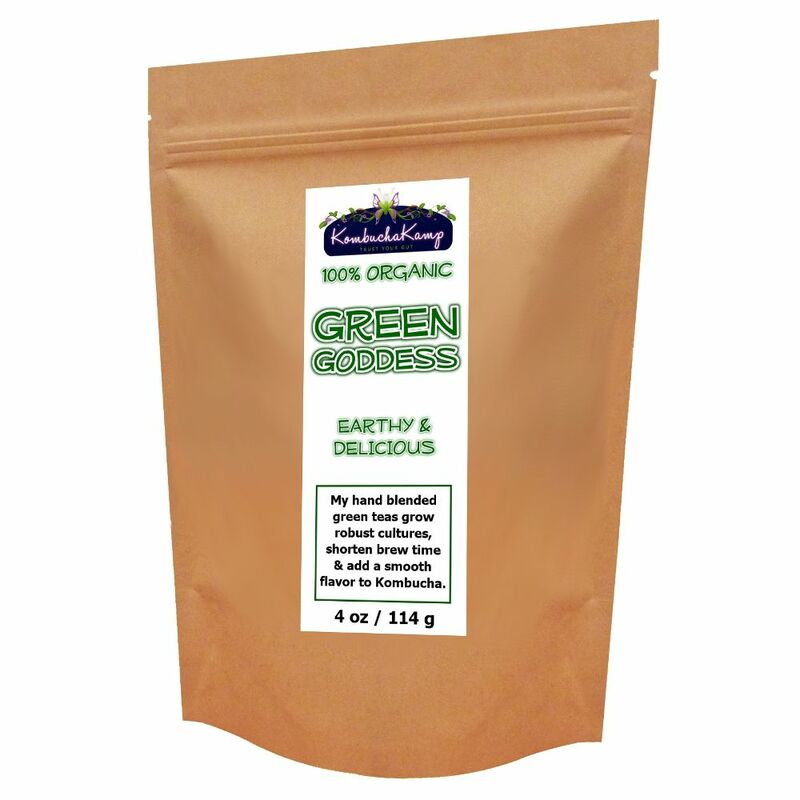 Hannah has done that with this Green Goddess Blend & it is wonderful alone as a cup of tea & it is right up there as an equal with Hannah's Special Blend as my two favorites to make my Kombucha with.